I really love Crossway Books. Yes, I've said that before. They publish solid, insightful, practical books which consistently call me on the carpet for my sins and encourage me towards repentance, only after which can change truly occur. I appreciate their continued dedication to the Gospel message. 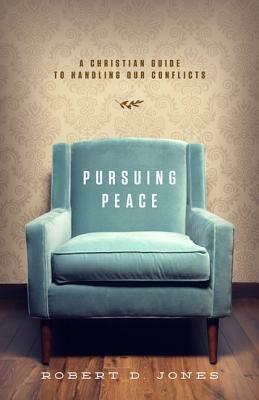 Pursuing Peace : A Christian Guide to Handling Our Conflicts was no less a "zinger" as far as I'm concerned and so I sort of want you to read this book just so that I won't be alone in working on the issues. Practically speaking, if you are human than you really ought to read this book and consider the things which Jones has to say. I do not believe that there is a human alive that is and can remain conflict-free. Conflict avoidant, yes! Conflict free? Absolutely not. The fact is, we were all born sinful creatures. Sinful creatures living with sinful creatures will produce conflict by their very fallen nature. Conflict happens. Instead of pretending that it does not, it is in our best interest to deal with it as accurately as possible to achieve the best relationships possible. Sweeping things under the rug is never a good idea. I should point out before I get going that this book is written to Christians with the assumption that they will use the things in here to resolve their issues with other Christians. He does talk a bit about resolving things with non-Christians and while I certainly think that such a thing is possible (and necessary and good and right sometimes!) I wouldn't take this book and apply it to my interactions with non-Christians across the board. But generally speaking Pursuing Peace is fit to be applied everywhere. Jones's main focus is on the Gospel - and rightly so. He reminds his reader that they are sinners in need of a Savior. Christ Jesus died on the cross to cover your sins and forgive them. Because of His great love and grace, you now have access to God. If all of this is true then you who have been forgiven much ought to find much to forgive in others, right? In the first few chapters, he establishes that we have a reason to believe that pursuing peace is a Biblical thing to do. But who are we supposed to pursue it with? Did you get that? We should be pursuing peace with everyone, including the person who stabbed you in the back, or slandered you to other friends and colleagues, who didn't believe you when you were trying to explain yourself to them, who abused you physically or hurt you emotionally. No, it is not going to be easy but it can happen if God is big enough. And since I believe He is big enough, I think any relationship can be healed and peace established in it. I also do not say that out of turn. I have personally witnessed the most broken relationships being brought to a position of honor before the Lord, wherein both parties feel a measure of peace. I didn't read this book just because it was "another Crossway title" but because I felt there was much to glean from and learn from the things that Jones had to share and teach. The biggest take-away from this book for me is the fact that I am a sinner. (Yeah. I know it's a fact. Thanks for pointing that out.) Stick with me here. What may be a fact to you is just a fleeting idea in my own mind. "Oh, well, I didn't mean to." "At least I'm not as bad as ________." Have you ever said any of those things to excuse away your role in any particular conflict with another? I know I don't spend enough time considering how my own sin has contributed to a conflict between myself and other people. I was convicted (and convinced!) when reading this book of specific instances where my having a bad attitude in the first place, kicked off a conflict. If my heart had been right before the Lord, what would have stayed a mole hill, just a blip on the radar, instead become a mountain. And it becomes difficult to move mountains. Not impossible! Just more difficult. Jones counsels and advises the reader to first assume that they sinned. After you have concluded that you have played a part, however small, in causing or prolonging a conflict, repent and apologize. And yes, your part may be very, very small in the grand scheme of things. But resist the opportunity Satan will grant you to compare yourselves to the other party and just own up about the plank in your own eyeball. A great bit of wisdom and truth which Jones shares in Pursuing Peace is that your first and primary responsibility in this life is to be in a right relationship with God. When your relationship with Him is in order, then your relationship with others will also start to look a bit more clean and tidy . . . or peaceful, shall we say? The same is true for your brother or sister in Christ. Their primary responsibility is to have a right relationship towards the Lord. When they have a bad attitude that sets off an argument, they have wounded you, yes, but their greater sin is unto the Lord. They have sinned before God by giving way to anger. Instead of fighting back, we should instead respond with humility and mercy. "Our Lord Jesus pleads for his perpetrators, "Father, forgiven them, for they do not know what they are doing" (Luke 23:24). Amazing! Jesus views his crucifiers as self-deceived and ignorant, and he mercifully prays for their forgiveness. Similarly, Paul explains how unbelievers are blind to God's secret wisdom, the gospel: "None of the rulers of this age understood it, for if they had, they would not have crucified the Lord of Glory" (1 Cor. 2:8). If their blind eyes had seen Jesus's glory, they would not have killed him. I tell you that reading this revolutionized the way I have thought of and think of people who have offended me. I can't say it's easy to re-program one's mind to focus on sin against God instead of sins against people but it really must be done. What if I hear someone "saying something stupid" and instead of reacting, I refused to take it personally? What if I put God and His holiness before my own feelings? How different would things look? It's going to take some practice to remind and teach myself how to respond to conflict in a more Biblical manner. (If you live with me or around me, hang tight.) All I can say in this moment is that reading this book has reshaped the way certain events in my past are organized in my head. I've been thinking through my own attitudes and behaviors (and there's more of that to do) and already my head is more clear. My thought life is more peaceful. There is less fear. Why? Because I'm learning (again) that life is not about me. Instead of worrying about everyone else's actions and reactions, the greatest thing I need to be worried about is this huge plank that is piercing my own eyeball! I hate it when reading books break me down. But a good book doesn't just break - it builds you back up! That's what Pursuing Peace did for me. I'll be thinking about this one for awhile and it will likely be re-read a time or two. Why? Because I'm still alive. As long as I'm alive and breathing on this earth, living amongst other Christians and sinners just like me, there will be conflict. I can bet on that. But I can also believe that God has a purpose and plan for any and all conflict and that is, ultimately, to draw me closer to Him. Peace in the midst of, or as a result of, these relationship storms is possible. Praise the Lord! Thanks, Crossway Books, for shooting a copy of this book my way in exchange for my honest opinion. I honestly loved it. "A Christlike perspective on your offender includes recognizing that person's slavery and self-deception. It means not taking that person's sin against you too personally." Another thought that a dear friend of mine shared when I sought her counsel in the midst of a conflict with another person came from something she gleaned from Oswald Chambers. “There is always one more thing in every person’s story about which we know nothing.” This has stuck with me and helps me look at offenses beyond both the surface-level appearance and my own emotional responses. Wow, that sounds like a worthwhile read for sure!! I especially liked the part about being more concerned about other people offending God than them offending us. cringe--I'm always a lot more focused on how *I* have been slighted! My local library didn't have this one, I am going to pick a copy up though! This sounds very convicting. Which is, of course, a very good thing. Sounds good. Added to the TBR list.